Whether you’re loading up your car for a road trip or you’re a professional driver, there’s a good chance one of our convenient travel stops is on your way. 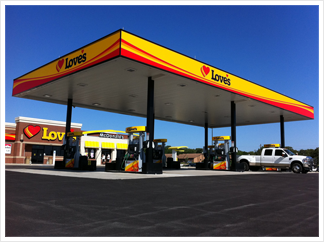 Love's has more than 410 stores across the country, providing highway hospitality 24-7 and the Clean Places, Friendly Faces that Love's is known for. What makes Love's Storage Solutions a particularly smart self-storage option for consumers is that we're located next to our travel stops, meaning we're convenient and in a well-lit, safe area. Our storage facility in Sweetwater, Texas, is located behind our travel stop at Exit 242 off Interstate 20. Our storage facility in El Paso, Texas, is located next to our travel stop off Interstate 10 along Horizon Boulevard. Our storage facility in Bridgeton, Missouri, is located next to our travel stop along Highway 370 at Exit 9. Our newest storage facility is in Las Vegas and is located next to our travel stop along Interstate 15 at Exit 64.